To the untrained – and sometimes trained – eye, Exterior Insulation and Finish System (EIFS) and Stucco often appear as one and the same. As popular building materials, EIFS and stucco seem aesthetically similar, and many believe they have the same basic properties, save one being an acrylic version of the other. However, EIFS and stucco couldn’t be more different, starting from the most basic level to the final, completed building system. Let’s start with the materials. Stucco, dating back to the Greeks and Romans, is composed of Portland cement, sand and water. EIFS is a relatively new cladding option that was introduced to the US in 1969. 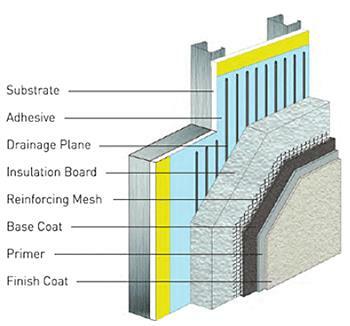 EIFS, a lightweight system, is comprised of a polystyrene insulation board secured to the exterior wall with an adhesive or mechanical fasteners, then reinforced with an acrylic plaster and fiberglass mesh on top, and finished with an acrylic and polymer coat that is both colorfast and crack-resistant. Some of the most notable differences can be detected in energy and thermal efficiency. EIFS serves as a continuous insulation system with no thermal bridging due to fasteners, which helps reduce building operation costs as well as air infiltration (by approximately 55 percent). It also provides insulation of an R-value of up to R20. Unlike stucco, which is limited to the thickness of insulation that can be used cannot come close to matching the R-values of EIFS and will never be as thermally efficient. While EIFS has the ability to achieve infinite design options with its wide array of aesthetic flexibility; however, with stucco, users are subject to a limited design palette. EIFS can look nearly any material on the market; something stucco cannot achieve. Alvarez, Derek. “One-coat vs. Three-coat Stucco vs. EIFS – Which Is Better?” CortezColorado. N.p., 17 Sept. 2014. Web. <http://cortezcolorado.net/one-coat-vs-three-coat-stucco-vs-eifs-which-is-better/>. 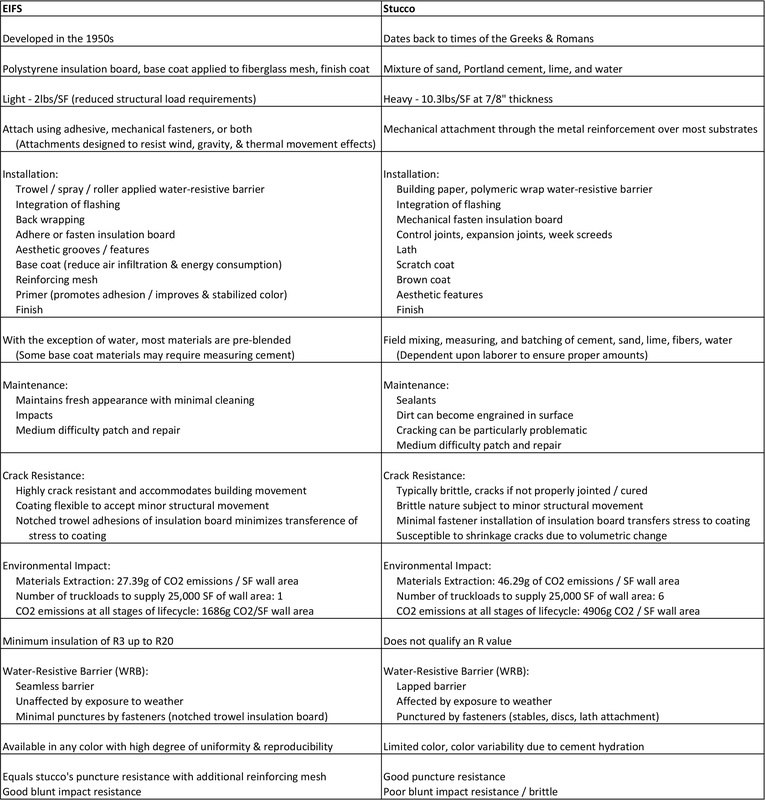 “EIFS vs. Traditional Stucco.” Total Wall 1021 (n.d.): n. pag. Web. <http://www.totalwall.com/PDF/TechNotes/EIFS_Stucco_Issue1021.pdf>. Lam, Jeffry R., and Heller Waldman. “Stucco or EIFS: Is There a Difference in Keeping the Water Out?” DriToday. N.p., 26 Nov. 2014. Web. <http://dritoday.org/feature.aspx?id=720>. “Stucco Over Insulation Board vs. EIFS with Drainage.” Minnesota Lath & Plaster Bureau (n.d.): n. pag. Web. Williams, Gary. “Technical Fact Sheet: EIFS vs. Stucco.” A Sure-Look Home Inspections. N.p., n.d. Web. <www.asurelook.com/system/files/userfiles/other/EIFS_vs_STUCCO.pdf Cached Similar>.